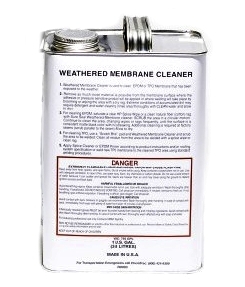 PRODUCT: WEATHERED MEMBRANE CLEANER FOR EPDM AND TPO. 1-GALLON/CAN. PRICE/CAN. Ordering Notes: Very Flammable, Hazmat Shipping, UPS Ground or Truck Shipment Only. DESCRIPTION: Weathered Membrane Cleaner is used to clean both new and in-service TPO prior to the welding process, or EPDM prior to application of Multipurpose primer or splice adhesives. It helps to loosen and remove dirt and other contaminants from the surface.